Canada is a test case for a grand notion—the notion that dissimilar peoples can share lands, resources, power and dreams while respecting and sustaining their differences. You might find it improbable that a young boy playing on the eastern slopes of British Columbia’s Coast Mountains once jumped on an iceberg and rode it down the Chilko River to where it joins the Fraser, and floated out to the sea. Or that when the iceberg melted, the boy turned into a salmon. Or that his family fished him from the water, and he transmogrified back into a human. You might also find it unlikely that such a story, and many others like it, was considered as evidence in a modern court of law. Most incredible of all, would you believe that the court case in question was won by the people who told these tales? Here’s another one: In the spring and summer of 1864, an Indian insurgency terrorized Vancouver Island and British Columbia. It began at dawn on April 30, when a dozen Chilcotin men slaughtered thirteen members of a road-building crew and cut out the foreman’s heart. The crew had been trying to open a shortcut through the Coast Mountains to the goldfields near the upper Fraser River. Fifty kilometres from the head of Bute Inlet, near the entrance to Chilcotin territory—not far from where Salmon Boy boarded his iceberg—their efforts ended in a bloodbath, and the Chilcotin War began. Few British Columbians remember the Chilcotin War. But if you ask Chilcotin descendants—well, how could they forget? Cowboy and Indian Roger William has spent most of his life fighting for the Nemiah Valley. On June 26, 2014, after one of the longest and most expensive cases in Canadian history, the Supreme Court unanimously ruled that the Tsilhqot’in Nation held title to approximately 1,900 square kilometres of their traditional territory. It took twenty-five years and marked the first time that an Aboriginal group in Canada had won a title claim. Most treaties have caused Aboriginal signatories to lose land instead of gain it. The Prairies, most of Ontario, and southern Quebec are covered by what are known as land-extinguishment treaties, meaning that most or all traditional territory was ceded to the Crown. In exchange, First Nations were given small reserves to live on and the right to use the ceded lands for traditional purposes such as hunting and fishing—a right that increasingly is being undermined by industrial expansion. Canada suspended the treaty process between 1921 and 1973, which corresponds with the Indian Act’s most aggressive prohibitions. In the four decades since, twenty-six modern treaties have been signed nationwide. A further seventy-five (fifty-six of them in BC) currently are under negotiation, but most are mired in dysfunction. More than 80 percent are in their second decade of talks, and several are in their third. A principal sticking point is land: the Crown has never offered more than a small portion of what Aboriginal negotiating partners claim as traditional territory, usually 3 to 5 percent. By choosing the court system over the modern treaty process, Tsilhqot’in got more than 40 percent—and established what Aboriginal title means, in practical terms. Most Canadian homeowners can buy, sell, mortgage, and use their property as they please. But land held under Aboriginal title must be held communally; no part of it can be sold or given to anyone except the Crown, and the land cannot be used in such a way that deprives future generations of its benefit. In other words, title falls short of absolute ownership. The Crown retains what the Supreme Court calls “underlying title,” seized at the moment of sovereignty and as yet unrelinquished. The implications of that underlying title are spelled out in the Tsilhqot’in decision. Chief Justice Beverly McLachlin, its author, declared that the Crown may override title if it can establish “a compelling and substantial public purpose.” She cites a previous Supreme Court ruling on the subject: “The development of agriculture, forestry, mining, and hydroelectric power, the general economic development of the interior of British Columbia, protection of the environment or endangered species, the building of infrastructure and the settlement of foreign populations to support those aims, are the kinds of objectives that are consistent with this purpose and, in principle, can justify the infringement of title.” While McLachlin goes on to caution that any such infringement “must be consistent with the Crown’s fiduciary duty to the Aboriginal group,” weighing the public interest against rights and title remains a legal grey area. There will be more litigation. If 1,900 square kilometres—about a third of the Greater Toronto Area—doesn’t sound like much, imagine 40 percent of all those parts of Canada where no land ever was explicitly surrendered by Aboriginal peoples: the Maritimes, where “peace and friendship” treaties do not mention land; areas in eastern Ontario and Yukon; vast stretches of Northwest Territories; and the majority of BC, a province with $159 billion in active and planned resource-development projects. For more than a century, Canada’s federal and provincial governments have assumed ownership of unceded lands without any clear legal basis for doing so. In effect, Aboriginal litigants argue, they’ve just taken it. Perhaps because no living Canadian has ever known it to be any other way, this state of affairs appears (at least to most non-Aboriginal people) to be both natural and entirely legal. What the Supreme Court said last year was, no, it isn’t. It is illegal, and it always has been. From the valley When the Nemiah Declaration was drafted in 1989, nobody knew if it had legal weight. We were eating a dinner of ham and scalloped potatoes in the home of William’s cousin Dinah Lulua, in the Nemiah Valley. The eastern shore of Chilko Lake was just visible through the aspens, hemmed in by jagged white peaks. Tsilhqot’in territory lies 225 kilometres north of Vancouver. Part of it is known as Xeni. The people who live here are Xeni Gwet’in, and there are about 430 of them, though you’ll only find 200 or 300 of them in Xeni at any given time. Their homes are scattered in clusters across the same valley through which the Chilcotin warriors led the colonial militia on that wild goose chase 150 years ago. Many of today’s Xeni Gwet’in trace their ancestry back to those warriors. The band is one of six that make up the Tsilhqot’in Nation, population 3,000. When William says “all the Tsilhqot’in territory,” he doesn’t mean just the 1,900 square kilometres that the Xeni Gwet’in hold title to. He means that plus the rest of the territory for which nobody’s gone to court yet. It was the end of a warm February, and William hadn’t stopped moving since June 26. In the months following the Supreme Court’s decision, he’d travelled across the country to share the story of his people’s victory with First Nations from BC to Nova Scotia. He’d been to Ottawa to speak with Aboriginal-affairs minister Bernard Valcourt. He’d been to the provincial legislature in Victoria to accept Christy Clark’s apology for the hanging of the Chilcotin warriors (“I think it’s a start”). Since the new year, his travels had narrowed to a continuous fast-paced circuit between Vancouver and Tsilhqot’in country, straining to apprise his people of the marathon negotiations with the province. The aim of those negotiations is partly to work out the countless jurisdictional details that Aboriginal title has called into question—Who’s in charge of roads? What happens to non-Tsilhqot’in businesses operating on title land?—and partly to wring more land from the government. But William and his colleagues also want the province to bring Ottawa to the negotiating table so that all three parties can hammer out a package of Tsilhqot’in self-government. “We just need to resource it,” William said. “Some of our families are two or three in one home. Some of these homes are condemned, and you shouldn’t even be living in them. To run a band-operated school we get half the amount of funding that a public school would get per child.” The tap water we were drinking came unfiltered from a creek above the house; it was clean then, but once the spring runoff began there would be a boil-water advisory. The list went on, and it could have described the conditions many First Nations face throughout the country. William’s aunt Mabel was seated on the couch behind us, watching a TV show she couldn’t understand. She is ninety-two and, like many elders, speaks only Tsilhqot’in. She’d spent most of her life living off a land whose harsh winters and low carrying capacity were another reason Tsilhqot’in had required so much territory throughout their history. I asked her once, through Dinah, what life was like back then. Just outside our window, forty-one head of cattle milled beneath the pines, and out in the hills beyond them roamed wolves and cougars and the wild horses for which Nemiah Valley long has been famous. 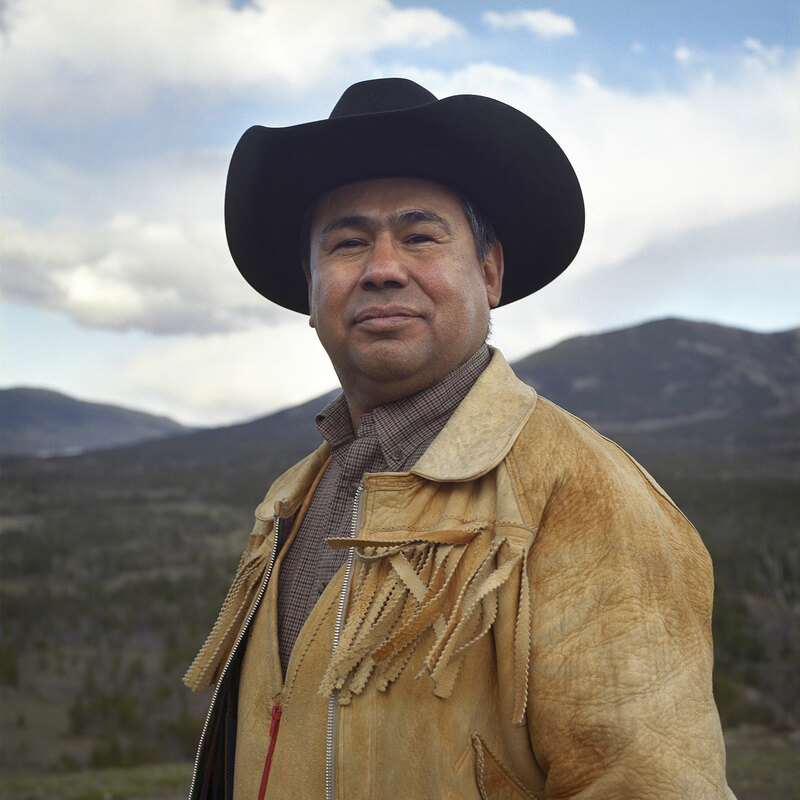 Modern Tsilhqot’in, to put it crudely, are both cowboys and Indians. They depend on moose and salmon as much as on the cattle they ranch. William, a rodeo champ in his youth, wears a black stetson and never leaves home without a drum. He was raised on the land and didn’t learn English until he went to residential school; his words still are inflected with a Tsilhqot’in accent. William turns fifty in August. He has been the Xeni Gwet’in chief on and off since 1991 and served as band councillor for three years before that. The case I came to discuss has consumed his entire adult life. 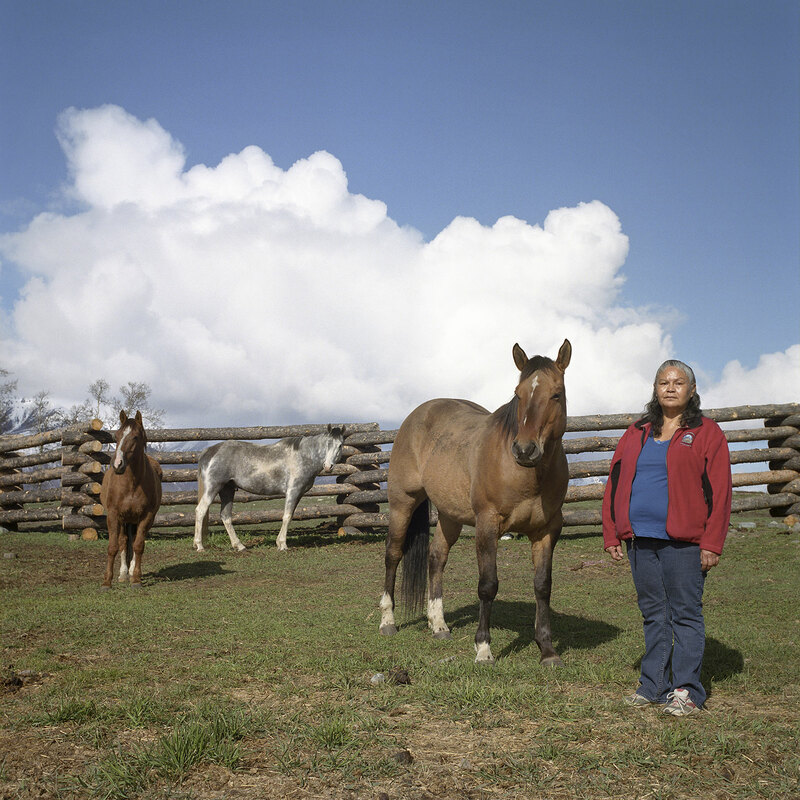 Home on the range Roger William’s cousin Laura D. Setah on her Interior BC ranch. In 1989, the Xeni Gwet’in band hired Jack Woodward, a lawyer from Victoria, to help them with some trouble. 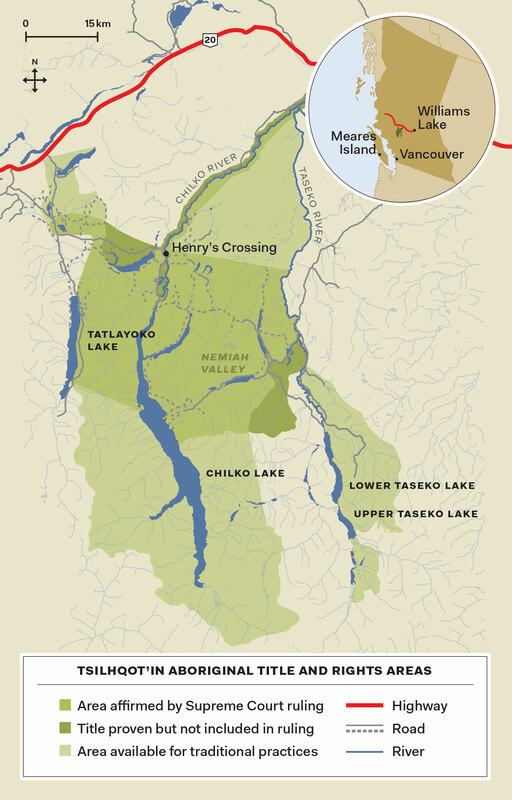 BC Hydro wanted to dam the Chilko, Taseko, and Tatlayoko Lakes, which would have ruined the spawning grounds of a quarter of the Fraser’s sockeye run. Worse, the Ministry of Forests had granted several logging companies permits to cross the Chilko and start cutting in Nemiah. 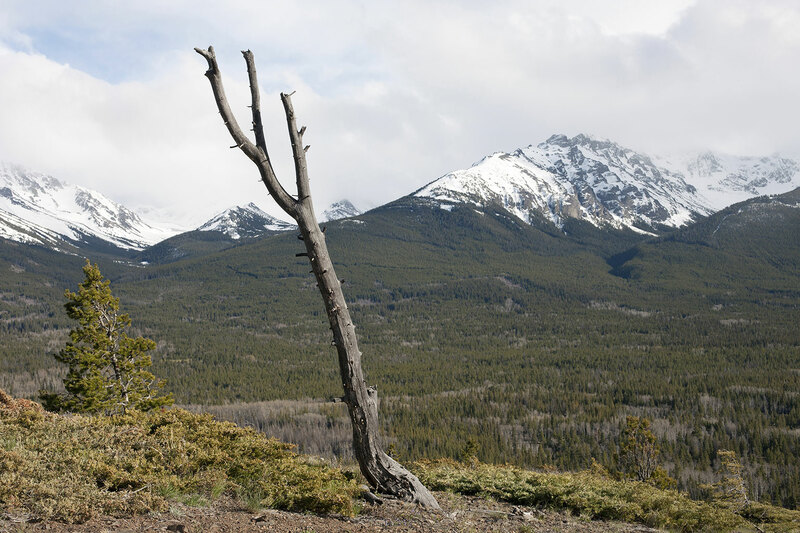 The other five Tsilhqot’in bands had seen most of their forests destroyed by the monumental clear-cuts of the 1980s. At the industry’s height, 250 loaded logging trucks were leaving their territory every day. Satellite footage showed the brown patches creeping right up to Nemiah’s riparian boundaries. 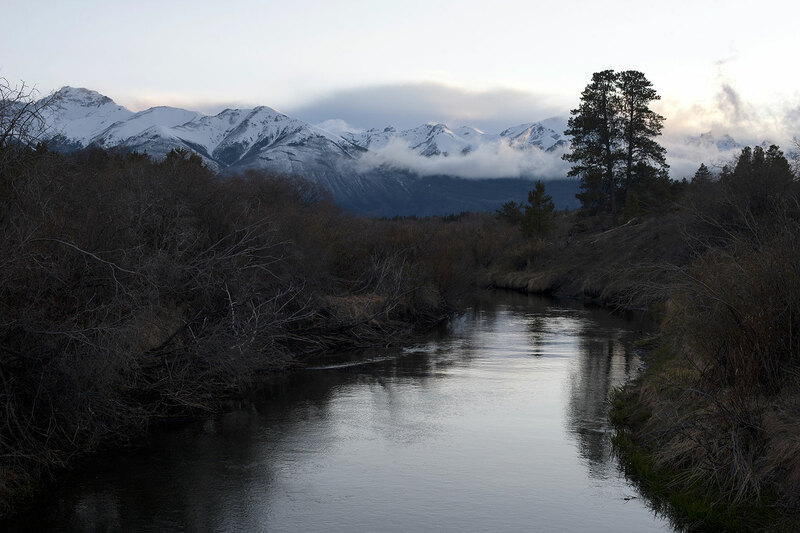 Isolated, rugged, and without a single logging road to access its centuries-old stands of spruce, pine, and fir, Nemiah was Tsilhqot’in’s last redoubt. Woodward had made a name for himself five years earlier in the Meares Island case. In 1984, the logging company MacMillan Bloedel was set to remove enormous stands of old-growth trees from the island, near Tofino, on Vancouver Island’s west coast. It would later draw to the site one of the biggest environmental protests in Canadian history. Among the protestors were two First Nations, Tla-o-qui-aht and Ahousaht, both of which had reserves on the island and claimed Aboriginal title to it. Woodward filed for an injunction to ban logging on the island while the court case went ahead. An appeals judge, Peter Seaton, ruled in his favour. “I cannot think of any native right that could be exercised on lands that have recently been logged,” he wrote in his decision. Meares Island was seen as a rare victory for First Nations. The title case itself ultimately was adjourned and left in limbo, but the logging injunction remains in place to this day. Among the most interested observers were members of the Xeni Gwet’in band council, who invited the lawyer to their isolated valley to discuss similar problems they were facing. As a legal term, Aboriginal rights was still in its infancy. While the concept dates back to the Royal Proclamation of 1763, an amendment to the Indian Act in 1927 wiped the slate clean by making it nearly impossible to file a land claim. (It was a criminal offence to retain a lawyer for this purpose.) That prohibition lasted until 1951, and it wasn’t until Pierre Trudeau brought the Constitution home in 1982 that “aboriginal and treaty rights” were enshrined as a principle of law under Section 35 of the Constitution Act. Woodward, who was living in Ottawa at the time, typed up a first draft of Section 35 for Ed Broadbent and two of his colleagues, which was then circulated and amended by other lawyers. It now reads: “The existing aboriginal and treaty rights of the aboriginal peoples of Canada are hereby recognized and affirmed.” And that’s pretty much it. There are a few more sentences to clarify that the definition includes “Indian, Inuit, and Metis peoples,” men and women alike, and that treaty rights include “rights that now exist by way of land claims agreements or may be so acquired.” That’s the extent of our constitution’s articulation of Indigenous rights. The word title doesn’t even appear (though it did in that first draft). According to Woodward, the only way to get so many politicians to sign off on Section 35 was to leave it open to interpretation; defining what is meant by “aboriginal and treaty rights” has been one of the Supreme Court’s major tasks over the past thirty-three years. In December 1989, Xeni Gwet’in cited the declaration when they asked the BC Supreme Court for a logging injunction similar to the one granted for Meares Island. They weren’t yet asking for title; they just wanted the courts to get the chainsaws out of their valley. A series of negotiations with the Ministry of Forests kept the loggers at bay for three years. But in 1992, forest companies began upgrading a small bridge at a site called Henry’s Crossing, on the Chilko, in order to make it strong enough for heavy-duty trucks. “We found out on Wednesday, May 6, 1992,” William recalled. “That night, a bunch of us went to Henry’s Crossing. We got there at one o’clock in the morning, and Xeni Gwet’in mounted a blockade.” The standoff lasted two months and became a media sensation. Worried about the political fallout, then premier Mike Harcourt finally stepped in and promised there would be no logging in traditional Xeni Gwet’in territory without the nation’s consent. Following the blockade, the band commissioned a sustainable-forestry plan, which found the Nemiah’s ecosystem could withstand the removal of 30,000 cubic metres of timber per year. The province came back with a plan to remove 1.8 million cubic metres over five years. The back and forth dragged on through the mid-’90s, with the court case pending all the while. Then the Nemiah’s leadership negotiated the province down to a five-year harvesting plan of 1.1 million cubic metres. The road taken Roger William spends much of his time on the Nemiah Valley’s main road, talking to constituents. On November 18, 2002, after thirteen years of failed negotiations, roadblocks, amended claims, and evidence gathering, Tsilhqot’in Nation v. British Columbia went to trial. Tsilhqot’in claimed rights and title to 4,400 square kilometres in and around the Nemiah Valley. To win, they had to prove three things: first, that they were the direct descendants of the people living in Nemiah when the Crown asserted sovereignty over British Columbia (that date, itself a matter of contention, was somewhat arbitrarily set at 1846, the year the Treaty of Oregon was signed between the United Kingdom and the United States); second, that their ancestors used all of those 4,400 square kilometres, rather than just specific sites, on a regular basis; and third, that their ancestors had exclusive control of the territory. Proving this presented a considerable challenge for a society that didn’t write anything down until well after 1846. Every land claim in the country faces some version of this problem. In the mid-1990s, while the Tsilhqot’in case was building, the Supreme Court came up with an extraordinary solution. In a series of decisions that in 1997 culminated in the (unsuccessful) Delgamuukw title case, the court declared that oral evidence—stories passed down by word of mouth from one generation to the next—should be allowed in Aboriginal cases, rather than automatically dismissed as hearsay. That edict revolutionized Aboriginal law. “In order to truly hear the oral history and oral tradition evidence presented in these cases, courts must undergo their own process of de-colonization,” wrote Justice David Vickers, the trial judge, in his 458-page decision. Twenty-nine Tsilhqot’in witnesses delivered testimony over the course of the trial. Twenty-six of them were elders, many in their eighties and nineties, and almost none of whom spoke English as a first language. Some couldn’t handle the journey to Victoria, so Vickers relocated his court to the Nemiah Valley in early winter 2003, converting a classroom in the local elementary school into a courtroom. And because some of the elders would tell legends such as that of Salmon Boy only at night, Vickers periodically held special evening sessions of court. The witness whose testimony mattered most, however, was the plaintiff himself. “I’ve never met anyone who has such a good memory,” Woodward said of William’s performance on the stand. “To be cross-examined, to be questioned even for ten minutes, is a pretty horrific experience.” He endured seventy-seven days of it. That examination was followed by twenty-eight days of questioning led by Woodward. The defence then had nineteen days to cross-examine and ferret out material inconsistencies. They didn’t find a single one. The trial lasted five years, and comprised 339 days of court hearings. On November 20, 2007, Vickers delivered his decision. Xeni Gwet’in, he concluded, had proved ancestral occupation to 100 percent of the claim area and therefore had the right to use the land—a substantial victory that gave the Tsilhqot’in people significant power over future development in the region. But on the question of title, Vickers decided that exclusivity had been established in just less than half of the claim area. Most critically, he defeated the Crown’s central argument that if Aboriginal title existed at all, it was only in tiny, specific sites of intense use—the so-called postage-stamp theory—as opposed to the “mountaintop to mountaintop” understanding that many First Nations have insisted on. Vickers, who died in 2009, never lived to see it. Canada, British Columbia, and Tsilhqot’in all appealed his decision. In 2012, the BC Court of Appeal upheld his ruling on rights but unanimously overturned the principles he’d outlined on title. The court supported the Crown’s postage-stamp theory. All parties appealed again, this time on the question of title alone. By the time the case reached the Supreme Court, in November 2013, William and his team had reduced their claim to the more than 40 percent area outlined by Vickers. Seven months later, the court ruled unanimously in favour of Roger William, Xeni Gwet’in, and the Tsilhqot’in Nation. 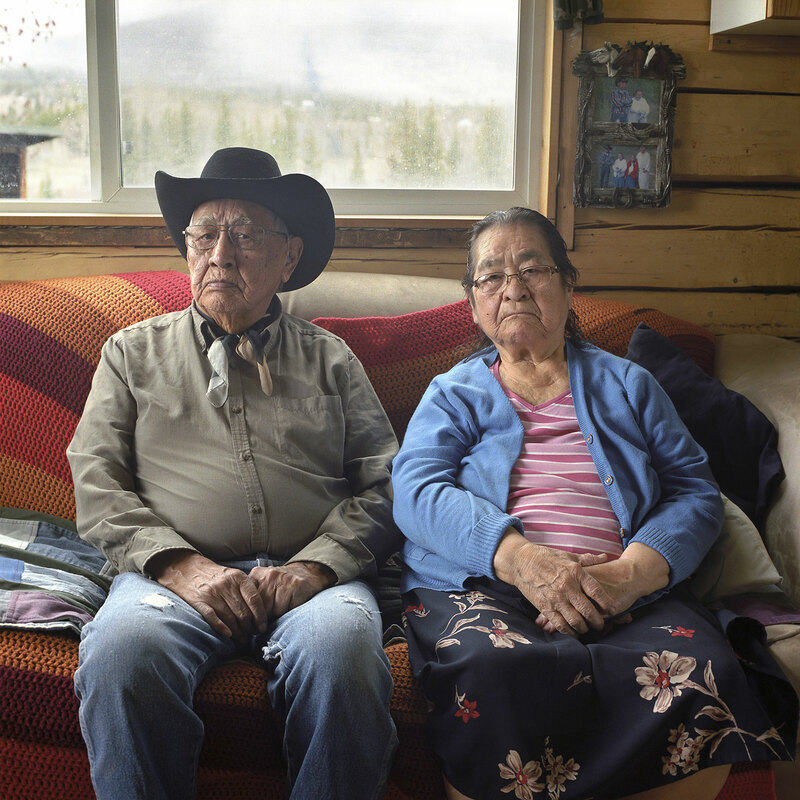 Stories they tell Julianna and Ubill Lulua testified in the Tsilhqot’in case. Last January, Geoff Plant, BC’s attorney general and minister responsible for treaty negotiations from 2001 to 2005, delivered an impassioned speech at the BC Natural Resource Forum, lauding the Supreme Court’s decision. His audience included many of the province’s industrial executives, First Nations leaders, and provincial cabinet ministers. Plant outlined a brief history of the legal arguments deployed for more than thirty years by the Crown to block Aboriginal title: It never existed. If it once existed, it was extinguished long ago. If it does exist, it isn’t here. The claimants waited too long. They’ll have to prove it first. This seemed a remarkable change of heart for a man who had once been the public representative of that intolerance. Near the end of his term, Plant helped shape BC’s “New Relationship” policy, aimed at reconciliation with First Nations. It hasn’t fared any better than the modern treaty process, but working closely with Aboriginal communities had a profound impact on Plant’s outlook. Even in the most optimistic (or pessimistic, depending on where you stand) scenario, that acceptance is still some ways off. Even in the shadow of the Tsilhqot’in decision, neither the provincial nor federal governments have given any indication that they’re prepared to soften their negotiating stance. BC Premier Christy Clark, for instance, recently alienated her province’s Aboriginal population by abruptly withdrawing support for an incoming treaty commissioner whom First Nations, Ottawa, and the province previously had agreed on, then questioning the usefulness of the treaty commission. At the federal level, the much-anticipated Eyford Report—commissioned by Ottawa last July and released this April—found that “Canada’s failure to publicly respond to Tsilhqot’in has produced what has largely been a one-sided dialogue about the significance of the decision and the attributes of Aboriginal title,” but refrained from encouraging Ottawa to be more generous. Instead, Douglas Eyford, the lawyer tasked with writing the independent report for Aboriginal Affairs and Northern Development Canada, noted that Ottawa already has spent more than $1 billion in loans and grants to First Nations in treaty negotiations that have yielded just twenty-six agreements since 1973. Eyford urged the Department of Aboriginal Affairs and Northern Development to wrap up what few of the seventy-five negotiations in play had a finish line in sight and find other ways to resolve the rest. One alternative that First Nations now can pursue with greater confidence is litigation. So far, however, no significant new title claims have been filed. When my visit to the Nemiah came to an end, William gave me a ride to Williams Lake, two and a half hours east, where the nearest airport is. It was dark, snow had just begun to fall, and two of his four children were sleeping in the back seat of the truck. I asked him what he’d like to say to Canadians who worry that our economy will suffer if too many First Nations get control of too much land. “We as Tsilhqot’in want to prove that theory wrong,” he said. Many non-Tsilhqot’in still own land in the Nemiah; their properties were excluded from the title claim, their businesses were safe, and almost all had supported the Tsilhqot’in people throughout their struggle. “If you can improve First Nations life, it will improve the province and Canada,” he said. For a man who’d spent the first half of his life fighting the government, and who seemed likely to spend the second half doing the same, William struck me as remarkably upbeat. While they were pursuing the rights and title campaign, Roger William and the Tsilhqot’in National Government spent more than two decades embroiled in another all-consuming win-or-die fight that weighed more heavily on many Tsilhqot’in minds than the potentially redundant struggle for ownership of land that pretty much everyone assumed they’d owned all along anyway. This second front opened in 1991 when a Vancouver company called Taseko Mines Ltd. started drilling exploratory holes in the Chilcotin Range, at the edge of the title claim area. There, Taseko found the tenth-largest undeveloped copper-gold deposit in the world: an estimated 2.4 billion kilograms of copper and 380,000 kilograms of gold, buried northwest of Taseko mountain. As in the rights and title case, the battle simmered for more than a decade before reaching a full boil. (Justice Vickers’s 2007 ruling put Taseko Mountain outside the 1,900 square kilometres of Tsilhqot’in Aboriginal title.) In 2008, the mining company submitted its Prosperity proposal for environmental review. Prosperity would have turned the area near Taseko Mountain into an open-pit mine; just below it, a fecund body of water called Fish Lake would have become a tailings pond. Fish Lake, known to British Columbia anglers for its abundant rainbow trout, is sacred to Tsilhqot’in for all kinds of other reasons that don’t need elaborating here. Suffice it to say that during my visit to Nemiah Valley more than one person I asked about “the court case” assumed I was talking about the mining project, and it would take a few confusing moments of discussion before we realized we were in different courtrooms. Here’s what happened in that one: BC approved the mine in 2010, but Ottawa turned it down based on a federal environmental assessment that found, among other things, the impact of dumping several thousand tonnes of heavy metal into Fish Lake to be egregious and immitigable. Taseko then came up with a second plan, New Prosperity, which would have created a tailings pond two kilometres south of Fish Lake. In this new iteration, the lake was to be preserved from toxic runoff by sealing it off from all natural intake and outflow, using pipes to circulate aerated water in and out, and essentially turning it into the world’s biggest aquarium. No one has tried doing anything on this scale to any other lake on the planet. In February 2014, New Prosperity was also rejected by the Ministry of Environment. During the second set of review panel hearings, Tsilhqot’in raised the possibility of a breach in the tailings pond’s containment wall. If that were to happen, billions of litres of contaminated water would pour straight into the headwaters of the Fraser, the province’s most prolific salmon-bearing river. Taseko Mines sought to allay concerns by pointing to another copper-gold tailings pond their engineering firm had designed nearby, at Mount Polley. That tailings pond, Taseko argued, was holding up perfectly well, and so would New Prosperity’s. On August 4, 2014, one of the walls containing Mount Polley’s four-square-kilometre pond collapsed, releasing more than 10 billion litres of water and 4.5 million cubic metres of slurry into Quesnel Lake, which also drains into the Fraser. You can watch the mesmerizing aerial footage of Canada’s worst environmental catastrophe in recent memory for yourself on YouTube. Taseko Mines Ltd. tried unsuccessfully to sue the federal government for damages over the unfair treatment it received at the hands of the environmental assessment agency. Both plans will now go under judicial review. Birthe Piontek (birthepiontek.com) has published with Le Monde, Wired, and The New Yorker.